We are used to watching multi-million dollar productions, which are slick and for the most part engaging, so can we easily adapt to watching less than perfect productions by untrained but enthusiastic individuals? The answer is clearly yes given the success of YouTube; we can accept imperfect technical quality providing the subject is engaging. I have learned a lot about video in the past year and discovered you don’t have to spend a huge amount of money to get good video. My new Fujifilm X-T2 – an excellent stills camera – does a pretty fine job. But good video doesn’t cut it without great sound and even the best sound and video is useless if content is boring or poorly presented. That requires direction and editing – skills I am learning bit by bit. When I started, I needed a subject to cut my video production teeth on. I remembered an old friend who is a bit of a technical wizard and a collector of vintage high-voltage equipment, capable of producing bolts of lightening and deafening concussions, drama and excitement. Then there is the man himself, Garry Garbutt, a character somewhat out of his time and one who likes to inspire and educate. Garry belongs to a dying breed of hands-on engineers who can actually take apart a machine, figure out its intricacies, and fix it when it goes wrong; he would also be the first to admit that we are fast approaching the point where we will be unable to fix anything other than the simplest devices. Indeed, we already throw away malfunctioning modules and replace them with new ones or just toss out the whole machine and buy a new, improved version. Although this blog has been more about writing, I’m better known as a photographer. During the ’80s and early ’90s I had a lot work published in outdoor adventure magazines and during the 2000s my focus moved to commercial and fine-art aerial photography with some newspaper work thrown in for good measure! All of that got me some shows in public and private galleries and published portfolios in national magazines. After a lull that’s lasted a few years I’m back at it. You can check out my work at davidskelhon.zenfolio.com or my Etsy print store. “The Beach (2015)” St. Ives, Cornwall is one of my favourite seaside towns. I’ve made a couple of visits in the last few years and for me this image captures the energy and joy of the harbour beach. 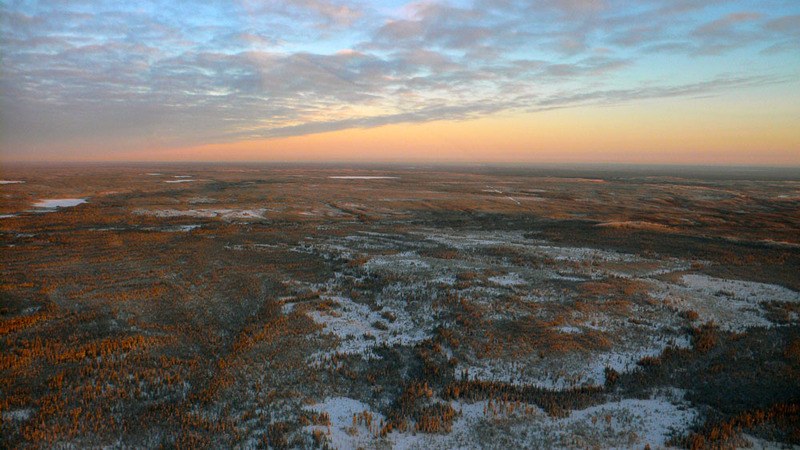 Northern Alberta can be bleak and lonely; it can also be beautiful at sunrise. You can’t beat winter so you may as well embrace it. Canadian winters are as cold as they come, although here in the BC Okanagan, just a couple of hundred miles from the warm waters of the mighty Pacific, they are manageable. A few years ago, I experienced a real Canadian winter as a rooky bush pilot. Stationed in Northern Saskatchewan, I discovered what penetrating, snot freezing cold can be like. I had just been hired by a Yukon based charter company and my new boss insisted that I had to get some winter training in the oil patch to “break me in” for the following Yukon summer. At that time things were booming in the great province of “Oilberta, the land of the blue-eyed sheiks.” I have always felt uncomfortable about the oil industry and its influences but I badly needed a job and this was probably my last chance as an older commercial pilot to work directly in the industry. I had spent the previous ten years involved in instruction, test flying and aerial photography. Well, at least I would get to see the oil industry from the inside rather than as a distant observer. After my interview in Whitehorse I made the two-day drive south to Edmonton, Alberta to get acquainted with the team and was immediately thrown in the deep-end, flying from Edmonton City Centre into Calgary International under the watchful eye of the Southern Operations Manager. I hadn’t flown in congested commercial airspace for at least ten years so this was a stressful wake-up. Somehow I muddled through and later that day found myself in Northern Saskatchewan, at least 60 miles from the nearest hint of civilisation (although not everyone will consider Fort McMurray meets that definition). The early fall air was surprisingly hot and sweaty and filled with droning black flies and mosquitoes. Camp was in the middle of nowhere and 50 miles of rough track connected it to the nearest road. Although Fort McMurray, “Oil Sands Central,” is only 70 miles away as the crow flies, the roads were so absurdly convoluted that it took 12 hours to drive there. Consequently, aircraft were a vital part of this exploration camps logistics. Somehow 300 people living in trailers in the middle of this wilderness needed to be fed regularly and supplied with equipment and materials. They also needed to go home every two weeks or so. Making sure that this happened was work for half a dozen pilots. I stayed for a few days then returned home and restructured my life for a completely new chapter. When I returned a couple of weeks later to begin my first two-week shift the mosquitoes had all but gone and the air was filled with freezing rain and snow. The great white beast had snorted. I soon realised why the trees are so small and stunted; there was nothing, absolutely nothing, between me and the North Pole to stop the wind. My trusty stead, a Cessna 206, was tied down at the end of a dirt strip half-a-mile from camp. When it wasn’t flying, the engine was wrapped in a custom fitted quilt, with every orifice stuffed with equally snug fitting foam bungs, all essential to keep warm air from escaping. A diesel generator delivered power to an electric heater under the cowling. Fabric covers adorned the wings and tail to keep the worst of the snow off. When flying, all these covers went with me. As soon as the engine stopped turning I would be outside putting the engine covers back on. I couldn’t afford to be on the ground for more than an hour or two without running the engine or plugging a heater, otherwise the engine would never start again until spring! 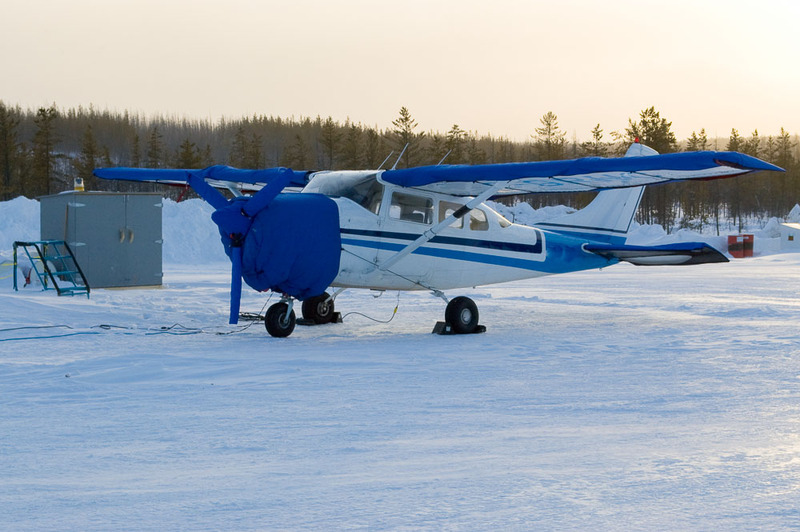 Keeping my Cessna 206 warm and ready to go was essential. The Cessna 206 has 6 seats and a large cargo door at the rear. It’s an easy to fly and versatile aircraft powered by a 300 hp engine. Although it isn’t a short takeoff and landing aircraft, it is popular around the world as a capable utility aircraft. There was no hangar and the only shelter was the company diesel pick-up truck which ran more or less continuously in cold weather. Company policy said that flying stopped if the temperature dropped below -40C because, below that, aircraft parts tended to break with little provocation. Not surprisingly, pilots also tended to experience mental and physical breakages in these debilitating conditions. A typical day would start around 6 AM in winter darkness. I would dress then run outside to start the truck. Hopefully one of us had remembered to plug in the block heater at the end of the previous day. A cold start for a V8 diesel in these temperatures was pushing the limits. Although it wouldn’t be light enough to fly until 9.30 AM, I needed to make sure the plane had some preheat. You need to understand we are dealing with ancient technology; these engines were on the engineer’s drawing-boards (literally) way before anyone had heard the term “computer” let alone “Computer Aided Design.” These air-cooled wonders burn heavily leaded, high-octane gasoline and are lubricated with mineral oil that congeals and makes starting impossible if the temperature drops more than a few degrees below zero. They have to be kept warm and cosy or they just won’t go or even worse, they can be damaged by just cranking them over. You don’t jump into a truck at these temperatures – you gently lower yourself into the seat because the foam has the firmness of concrete. Once inside your breath freezes instantly on the windshield. One morning I discovered the block heater hadn’t been connected and I had to get down to the airstrip. Fortunately, all credit to Ford, the truck started quickly but the noise was frightening. Serpentine belts squealed and valves and pistons clattered so loudly that I thought the thing was going to fly apart. It didn’t, of course, and after 5 minutes it was throbbing away like any V8 diesel. At these temperatures, tires develop temporary flat spots, making driving away, well, interesting. I headed down the track. My headlights revealed the stark contrast between the dark outlines of the stunted black spruce and the glaring snow. Slowly the heater began to force a hint of warmth into the cab. As I pulled up in front of the Cessna, my main beams illuminated its ghostly outline against the black velvet sky. I jumped out and heard the reassuring drone of the generator. Sometimes the wind would drive snow into the nooks and crannies of its covering panels and occasionally into the air intake and stall the motor. I twisted off the fuel cap – yes, security had done their job and the tank had been topped up during the night. After a quick check under the 206’s cowling to make sure the heater was still running, I headed back to camp for breakfast. Breakfast was good and big. I needed to stoke-up for the day ahead. Meals were always the most welcome time of day and the menu was invariably gourmet. It was also a great time to socialise and catch up with the gossip. I’m sure the oil barons realised that good food was essential to keep the troops happy. I would grab a sandwich on my way out in case I didn’t make it back for lunch. Now it was time to head back to the trailer to check the weather and see if the day’s objectives could be met. It was Thursday and time for some major camp crew changes. Another operator with a bigger twin-engine Piper Navaho would be here at first light to move the bulk of aboriginal employees back to their reservations. I would do the clean-up and take those he didn’t have room for. I would be taking people home to their families after a week of work. It still surprises me that government regulations permit a single-engine piston aircraft designed in the 1950’s to carry paying passengers across some of the harshest terrain on the planet in the middle of winter. No less surprising is the fact that I am willing to fly it. Getting lost or disorientated out there is not an option. I was mainly reliant on a consumer GPS mounted on the control yolk. Traditional avionics either didn’t work or were outside the range of coverage. The blank, white landscape is featureless, except for numerous lakes covered with snow. Once, while heading back to camp near twilight my GPS unexpectedly froze and refused to reboot. I had a few anxious moments as I tried to figure out my location on the chart. I held my heading and when the camp lights eventually twinkled in the distance I heaved a sigh of relief. I hadn’t said anything to my passengers; they were dozing in their seats and hopefully remained blissfully ignorant. I often ponder why I was prepared to take such risks. Statistically, this is one of the most dangerous jobs in North America. Many of the pilots I know have had major accidents or incidents in their careers and I was later to find out I wasn’t immune. Perhaps it is the challenge that lures us. There is freedom in the air, despite the daunting regulations and procedures; there is an element of luck and undoubtedly a high degree of skill. There were few easy days and I always felt challenged. Unlike my fellow pilots, I had entered this career late in life. This put me in an unusual position. I felt that some of my colleagues were irritated by the combination of maturity but inexperience in the art of bush flying. Many of them started their careers on a float plane dock, eager for any chance to take the controls. They worked their way up, being mentored by more experienced pilots. Most, no doubt, served their time loading and unloading freight, cleaning airplanes and doing the general grunt work that makes a small operation function. I didn’t mind that either. But I had to learn basic stuff like loading 45 gallon fuel drums weighing more than 300 lbs single-handed into an aircraft and getting them strapped down securely. It is a very physical job. And then I needed to know what was possible in the air. How windy was too windy for a flight through the mountains? Could I fly at 500 feet above ground in light snow and still safely make my destination? The fact that other pilots were doing so regularly wasn’t good enough for me. I wanted to find out what I felt was safe in a slow and deliberate fashion, rather than taking off one day and realising I had bitten off more than I could chew and putting myself and my passengers in mortal danger. The fact that I had flown a huge variety of aircraft, undertaken many sailing adventures and had a diverse range of skills carried little weight with my colleagues. Sure I had a lot to learn, but I didn’t need to learn how to overload an aircraft and cook the log books to suggest otherwise. These things were just plain dumb but they sometimes happened in other outfits. On one occasion I was loading geological core samples into an aircraft. When I calculated I had a full and legal load I told the client I had a full load. He replied that a previous pilot had taken a much bigger load and perhaps I should reconsider. I stood firm much to his irritation. Had I been a 20 year old rooky in my first job I’m not sure my answer would have been the same. When I wasn’t flying people to communities such as Buffalo Narrows, Île-à-la-Crosse, or Meadow Lake, I was picking up groceries in Fort McMurray or drill parts from Red Deer or executives from Calgary or Edmonton. I grew to like my passengers and loved to hear their stories – especially the native people. Here in the north, living on reservations, they had lives very different to mine. Their homes were often hundreds of miles away, sometimes at the ends of unforgiving gravel roads. To some of them, a job was a lifeline that could lift them from poverty, and some times drugs and petty crime. In fact, the recent introduction of drug testing on the camp meant that they had to stay clean. Unfortunately, as I soon discovered, these hard-working employees were the first to suffer the effects of the 2008 crash. Oil prices plummeted and suddenly no one wanted high cost oil. One flight in particular sticks in my mind, probably because it was at night. Most of my flying has been in the mountains of British Columbia and consequently I rarely fly at night because it’s rather risky. On this particular day in the late fall I was sent to Red Deer to pick up a vital piece of drilling equipment. I arrived in the late afternoon and struggled for an hour to get it loaded into the aircraft. It was a very heavy piece of drill pipe with a special steerable drill bit, which was undoubtedly worth considerably more than my Cessna 206. Getting it aboard required removing the aircraft’s passenger door and one of the rear bulkhead covers. It only just went in, with one end under the rudder pedals and the other against the rear baggage bulkhead. By the time I had it strapped down to my satisfaction it was almost dark and I had a 3 hour flight ahead of me. There was just a sliver of moon but it was otherwise clear and I felt confident but a little nervous. The flight was relatively uneventful but I remember the feeling of profound loneliness after I left the lights from the cities and small communities of central Alberta behind. It’s hard to describe how isolated I felt from the rest of the world as I made my way north at 150 mph. The snowy landscape merged with the inky black sky as a fuzzy, rather indistinct horizon. Stars shone above and at times the odd light from a property or vehicle gave the impression it was hovering close by. The brain plays subtle tricks under these conditions and I frequently referenced my instruments to make sure I was flying straight and level. It was about -10C outside and I was cruising at 7,500’. As I searched the heavens for the pole star and familiar constellations I realised it had been a long time since I had felt so close to the Cosmos. In fact, it was nearly 20 years ago, alone on the deck of a sailboat in the wee hours of the morning as I sailed with friends across the Bay of Biscay from England to Spain. Once on the ocean; tonight in the sky. How few of us get to jobs that give back like this. I was snug in the cockpit watching the odd light move below me then disappear into a thickening haze. It was about 8 PM when I was surprised by a familiar voice on a frequency used by Flight Services and for occasional chit-chat between lonely pilots. “Traffic in the vicinity of Long Lake this is Flare 340 descending through flight level two-zero for Fire Crest.” It was my friend Rhys, who lives just a stone’s throw from me in the Okanagan. He was captain of a 727 taking workers and supplies into a large operation north of Fort Mac. Although there was no potential for conflict I couldn’t resist calling him back. He was I’m sure equally surprised. We exchanged a few pleasantries and I couldn’t help feeling a certain cheer. He was in a different world, flying big, complex machinery with a crew and maybe 100 passengers to consider. He would be on the ground and back in the air before I reached camp. I pride myself in good navigation. Charts and a compass had taken me around Britain on a small sailboat. Right now I was dependant on a consumer GPS to get me to a tiny camp 50 miles from the nearest civilisation. I doubted that I would find it if this magic box ever quit. Not that I would be out of options; a detour west to Fort Mac would be in order and even tonight, the lights would be easy to see from 20 miles. When the lights of the camp eventually came into view I prepared myself for what would be the most difficult part of the trip. This part of Saskatchewan is fairly undulating. Just south of the camp was an esker, a sinuous glacial feature that rose to nearly 300 feet above the surrounding forest and pretty much embraced the camp. It had a radio tower on it with a red beacon and I needed to stay well away from it. The strip was about a mile west of the camp and its snow covered surface was marked by dim, solar powered marker lights, positioned about 100 feet apart. There were absolutely no other lights for many miles and I well knew that I mustn’t be fooled by the “black hole illusion.” In the short history of aviation, many pilots have fallen for this and crashed short of the runway thinking everything was well. I scared myself on the first approach. I was too busy trying to figure out where the esker was and I aborted about half a mile from the runway thinking I might be too low. With no lights for reference I was on instruments for much of the following circuit. I was happy with my next approach and I made a perfect touch-down on the snow. It was a good end to a very good day. I had been in the air nearly seven hours and, as I was paid by hours flown I had actually made some good money! When the price of oil crashed the oil barons decided to pull the plug and abandon the project. When I started in September there were nearly 300 people working in camp at any time. When I departed at the end of my final shift in March 2009 only 20 remained. It looked likely that my short foray into the commercial world was over too. Camp morale was at rock bottom as I prepared to leave and the weather was hellish. When I left camp for the last time I was alone. I climbed to 4,500 feet and tried to dodge snow showers; the air temperature was -25C with a 20 knot wind out of the north. Even with all the cabin vents blocked off the temperature in the inside was well below freezing. Although I was dressed for the conditions it was going to be a tough two-hour flight back to Edmonton City Centre Airport. I had been in the air 30 minutes when I noticed the right fuel gauge was falling much faster than it should be. Had I forgotten to replace a fuel cap when I was refuelling? It seemed unlikely but I couldn’t take the risk so I diverted to Fort Mac. Once on the ramp I climbed up onto the wing to check. It was in place. I dipped the tanks and found that I hadn’t lost fuel and put it down to a malfunctioning gauge. I was now already cold but had to press on to Edmonton. The remaining flight was rough and I was constantly feeling my way around snow showers with their greatly reduced visibility. The terrain is fairly flat but it is dotted with potentially lethal radio towers and their supporting guy wires. I had been advised to stick close to roads and railways in poor visibility, as they don’t build towers on them! My breath was freezing on the cabin windows and windshield and I needed my credit card as scraper. As darkness descended during the final 30 minutes of the flight I was convinced that I was heading for hypothermia. My feet were frozen and I was constantly flexing my calf and thigh muscles to get some blood flow. By the time I had the airplane on the ground, parked, tied down and unloaded I was in a sorry state. After a taxi ride back to the company apartment I had started to warm up again. I was famished and when I opened the fridge door to find the interior bare I decided to walk to the closest restaurant about 20 minutes away. It was excruciating; battered by 50 km/hour winds and blowing snow I fought my way to the nearest mall wondering what I was doing here in this icy hell. It was my last day in Edmonton and I’ve never, ever, looked back. In the following months I pondered what I had learnt about the oil industry. I found it full of many decent people who, like me, were just trying to make a good living. Most seemed concerned about the environment. When the price of oil is high, this is a hugely profitable industry and therefore very seductive because it offers employees heady pay cheques that are hard to beat elsewhere; it also offers governments a cut of the profits which, if you ignore the environmental costs, have enticing short-term political benefits. I was genuinely shocked when I discovered the size of industry pay cheques. I once heard a young camp maintenance supervisor complaining that he was “only getting $1150 per day.” Of course, compared to executives pay, it was a drop in the ocean. This money, ultimately, wields huge power and influence that frequently overrides environmental concerns and distorts regional economies. Globally, our addiction to oil has catastrophic effects. Wars are fought over controlling this resource and maintaining the status quo. Imagine, for a minute, what would happen if we discovered an alternative energy source that was clean, generated locally and cheap. Would the existing power structure willingly give up this hugely profitable racket? I’m not so sure! Looking back nearly 25 years it’s obvious there has been dramatic change in our world – especially in technology. But the human spirit and the search for meaning in life is growing stronger as more of us realize it is becoming impossible to thrive in a system which essentially alienates us from our Earth, and our true selves. Suilven’s Travels was written to inspire others to step outside the box and live closer to the Earth. It is available for $3.99 as an eBook on Amazon, Smashwords and many other outlets.